Looking for Micro Machines Wii? Keep looking. Codemasters is a British developer that makes some great racing games. My first exposure to them was back in the NES and Genesis days with their excellent Micro Machines series. These top down racing titles featured everyday household objects like cups, pencils, and Cheerios arranged to make a fun and interesting track for the tiny vehicles to race on. 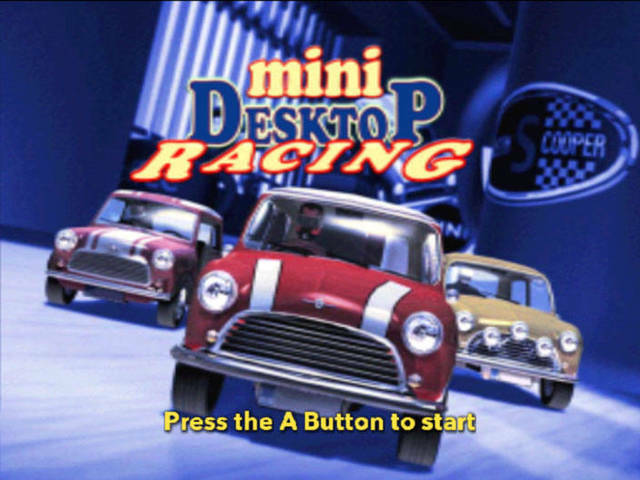 Codemasters, however, had nothing to do with Mini Desktop Racing, apart from having been the obvious inspiration for it. No, this game was developed by Data Design Interactive, another British developer that somewhat infamously was caught simply re-skinning their games and calling it a new game (For that story, feel free to look up the remarkable similarities in gameplay, level design, controls, etc. in Anubis II, Ninjabread Man, Rock N Roll Adventures, and Myth Makers: Trixie in Toyland). Their quantity over quality approach to game development is the stuff of legends. After seeing their logo pop up when the game started, I knew I would not be getting the Micro Machines experience I had hoped for, and braced myself for what was to come. And there are so many problems with this game it's hard to know where to start. How about the back of the box? It might put the fun back into driving a real Mini (if such fun had ever been lost), but only in comparison to playing this less than stellar title. Claim #2: Mini Desktop Racing features breakneck racing in the fastest officially licensed Mini game on the Wii. To my knowledge, the only other officially licensed Mini game on the Wii is Classic British Motor Racing, which features the Mini and several other makes and models. Coincidentally it's also developed by Data Design Interactive. I reckon one reason there aren't more licensed Mini games for Wii is because British Motor Heritage saw what Data Design did with the license and vowed not to make that mistake again. As for the speed, I certainly wouldn't describe it as breakneck, except perhaps to make a joke about what you might wish to happen to the developers to stop them from making a sequel. Claim #3: Mini Desktop Racing lets you loose with a crazy selection of officially licensed Minis, each accurately rendered with distinctive performance abilities. There are eight different cars in the game (six of which must be unlocked). And by different, I mean the paint job is different, and the stats (which I assume are top speed, acceleration, and handling, but it's not explained in the game or the manual) vary slightly. It's important to note these are not different models of Mini vehicles - it looks to be just one basic polygon model with different skins. I did not notice an appreciable gameplay difference in the cars I played, some just seemed slightly better or worse at turning. Compare this to Micro Machines on the NES which featured Jeep-style cars, sports cars, monster trucks, power boats, and more for a total of nine completely different vehicles. More if you count different colors like Data Design wants to. Claim #4: Race your inch-long miniatures around the wildest tracks where everyday objects appear immense in size and can become lethal hazards. There were no "lethal" hazards - most of them just caused you to stop. Falling off the track just gets you reset back on the track in roughly the same location. Everyday objects didn't appear immense, because the cars themselves look and feel small. There are some hazards like plastic cups, pencils, and erasers that you can move or push when you hit them, potentially making it easier or harder to get through that section on the next lap. Claim #5: Hurl around familiar household environments knocking over trackside objects and causing havoc for your opponents. Build up your skills and quick reflexes to unlock hidden extras including new Minis, upgrades, tracks and much more. Hurl is, in fact, the correct choice of words. This game has a decent framerate in the time trial mode, but significant slowdown and choppiness in an actual race, sometimes even when there are no other cars on screen. It caused a bit of a motion sickness reaction from me. The familiar household environments they mention are such varied locations as Office, Office, and Office. Which, technically, isn't that an office environment, not a household environment? If it's a home office, they sure do have a lot of people working there based on the number of chairs and computers you drive on and around. Regarding the hidden extras, I got my profile to 100% completion of the game, and have not seen any "upgrade" unlocks. And certainly nothing that qualifies the "much more" statement. There are the six locked cars (for a total of eight) and five locked tracks (for a total of six). Perhaps the "much more" was in reference to the two unlockable tournaments (for a total of three), each of which uses a different selection of four of the six available tracks. Once again, in comparison, Micro Machines for NES had twenty-seven tracks in a variety of settings - on the breakfast table, in the garage, on a pool table, in the bathtub (THE BATHTUB! ), etc. Let's talk a bit about how you unlock the cars and tracks. As you race, there are coins scattered across the tracks in various locations. Claim #6: Use the Wii Remote: In the driving position and control your Mini like you hands were on the steering wheel itself, tilting your controller to maneuver around corners or to ram an opponent off the track. In fact, my first few races. I couldn't get anything higher than eighth. Eventually, I acclimated to the bizarre choice of twisting motion controls instead of the standard tilting. Also, you need to take your finger off the accelerator regularly to make some of the sharper turns. There is a button for the handbrake, but I found it did not help much, if at all with the sharp turns. I've thought long and hard about why they would choose this particular control method, and I believe it was inspired by the design on many hobby-grade radio controlled car transmitters. You have the pistol trigger style acceleration with the B button, and the dial style steering by twisting the Wii Remote. Regardless of what inspired it though, it would have been much better if they had at least included any alternative control options. 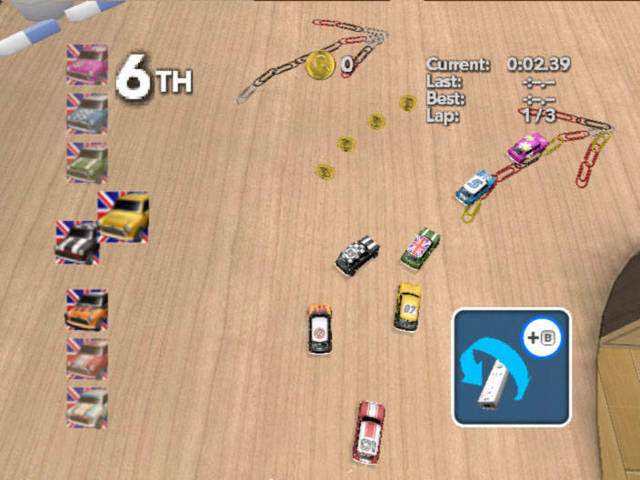 Many of the other racing games on Wii also offer alternatives such as Classic Controller, Nunchuk, or the like, so there really is no reason this game can't. Claim #7: Compete against friends wheel to wheel in the insanely competitive multiplayer mode with each track individually designed for a unique racing experience. Technically speaking, this should be "Compete against friend." Despite many Wii games supporting up to four players, Mini Desktop Racing limits you to only two: You and one soon to be former friend. Being a top down racing game, the ability to see the obstacles ahead of you is already limited compared to a standard behind the car or in the car view. So the logical choice for split screen is one player on the left, and one on the right to maximize your viewing distance. Naturally, Data Design Interactive went the other way instead - splitting the screen into a top half and bottom half to make it twice as easy to run into everything, because you can't see it until it's too late to turn. If you want to be insanely competitive in this mode, you'll need to memorize all the tracks, because reflexes alone won't be good enough. Claim #8: A perfect combination of miniature Mini mayhem and madcap multiplayer madness. When in doubt, try to impress the consumer with your alliterative skills. Because heaven knows there's nothing in the game that would impress. I think the only facet of the game that hasn't been touched on yet is the sound. There are generic engine noises, and two music tracks for racing (one of those tracks is also re-used for the menu). They are both bland and forgettable. In conclusion, despite disliking this game immensely, I can sense a seed of something good here. The track designs are moderately interesting, there just aren't enough of them. With better controls, more tracks, more varied environments, and a better framerate, it could actually have been something worthwhile. Or maybe that's my rose-tinted nostalgia about Micro Machines talking. This may well be the best of Data Design Interactive's games, but sitting atop that pile isn't necessarily something to brag about.